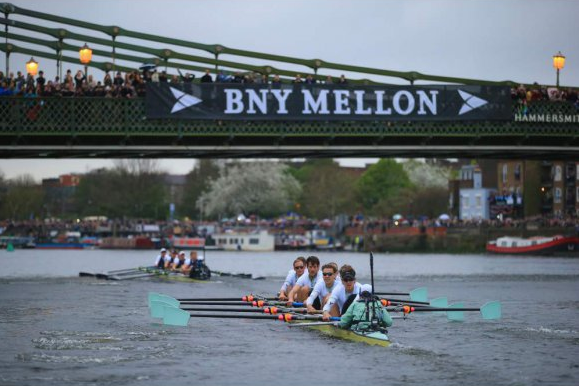 The Boat Race course, known as The Championship Course is 4 miles, 374 yards or 6.8 km long. It stretches between Putney and Mortlake on the River Thames in south west London. This course was first used for The Boat Race in 1845 and has been used for every Race since; apart from 1846, 1856 and 1863 when the race was held in the opposite direction between Mortlake and Putney. The Boat Race is rowed upstream, but is timed to start on the incoming "flood" tide. 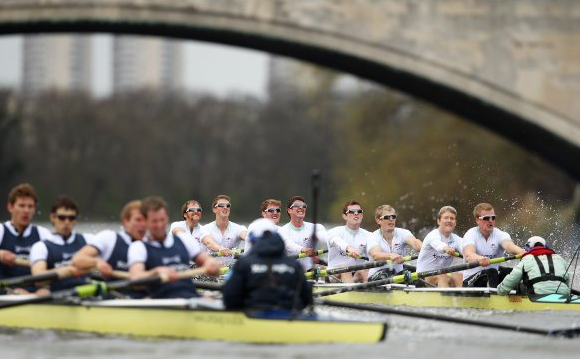 The Men's Boat Race is an hour and a half before high tide, with The Women's Boat Race a further hour before so that the crews are rowing with the fastest possible current. 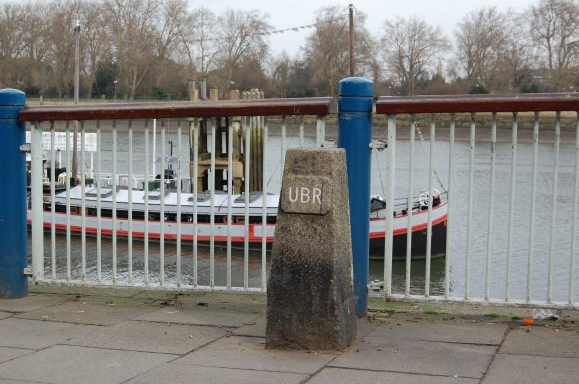 The University Stone is set into the towpath on Putney Embankment a few metres below Putney Bridge. 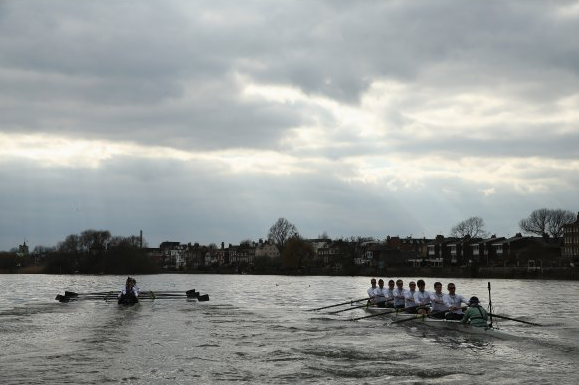 The Boat Race will start from two stake boats moored so that the competitors' bows are in line with the University Stone. There is an equivalent stone set into the bank, adjacent to The Ship pub in Mortlake, at the finish of The Boat Race. At Hammersmith Bridge the advantage of the Surrey bend starts to come into play. Traditionally cox's aim for the second lamp post from the left as they pass under the bridge. 80% of crews ahead at Hammersmith Bridge go on to win. It is at this point the cox on the Surrey station can steer a course to capitalise on their advantage, trying to push the Middlesex crew as wide as the Umpire will allow. The Men's Boat Race record to Hammersmith Bridge of 6 mins 20 secs was established by Cambridge in 1998, and The Women's Boat Race record of 7 mins 8 secs was also established by Cambridge in 2017. Pronounced eight, Chiswick Eyot is a small uninhabited island, formerly used for growing osiers (a type of Salix or Willow used for basket making). It is now a nature reserve. The river is very briefly straight here and as a result can be exposed to some rough conditions - such as The Boat Race in 2006. Often one crew will make their decisive move as they approach the island. The finish is just before Chiswick Bridge, marked by the University Boat Race Stone on the Surrey Bank and a post in the river on the Middlesex side painted in the University's colours. Chiswick Bridge was opened by the Prince of Wales in 1933. After months of training, if not years, it is here that the winners express their joy and the losers their despair. The Men's Boat Race record is held by the 1998 Cambridge crew who completed the course in 16 mins 19 secs. The Women's Boat Race record of 18 mins 33 secs was established by the 2017 Cambridge crew. The times however mean little when considered against the result of the day; won or lost.